Royal Marines Novelty Cake. Of course it goes without saying when we were asked to do a cake for a future member of the armed forces that we would do it. 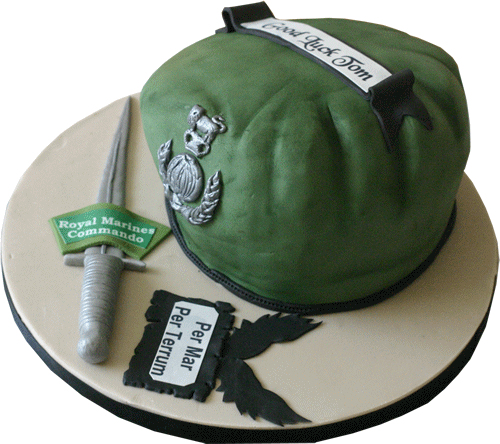 We were requested to replicate a Royal Marines Commando Beret in the form of a cake where everything was edible. This particular cake was requested as a chocolate and chilli infused sponge. As we bake all of our cakes to order, we obviously stepped up to the request. Airing on the mild side for the chilli we made the beret from a 10″ round cake and started to cut it down and shape it to resemble a worn commando beret. Once the required shape was achieved, we then covered it in an army green coloured fondant and added the final creases. The wings and dagger were made separately by hand out of flower paste and are also edible. The fun part of this cake was to replicate the commando’s badge for the beret. Shaping and cutting the pattern by hand was a nice challenge. The finished cake was placed on a 12″ round board to allow for the wings and dagger to sit beside the cake. Whichever of the armed forces you are in, give us a call for your bespoke 3D designed cake. Including Tanks, Armoured vehicles or any other item. 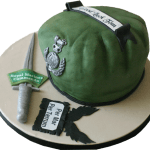 This cake is available in a full range of flavours and we will make any other regiments cake if required. For more info on other sizes and types please use our contact form from the menu above. Please note decorations may vary slightly as each cake is baked individually. Use the form below to order online, or if you prefer speak to or email us direct. To pay in full now, select (Order now). To reserve your date and pay the balance later, select (Pay deposit). Many thanks for your enquiry. I would need to know some further details in order to give you a correct quote. What date would you require it for, how many people to cater for, and some other information like delivery or collection. If you could please go to our contact form which can be found below and select the (cake enquiry option). If i understand correctly it is the Dagger you would like as the cake. 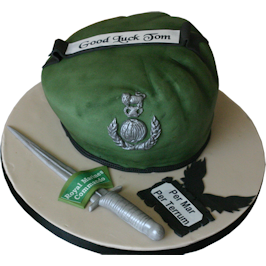 My eldest lad just about to join following me into Corp. My partner mentioned getting a commando dagger shaped cake (after all he aint one of the few just yet) and thus wanted to have writing on the cake, “Look at you, Look at me, Look away”. Any idea on cost and how quick it can be done? We ask for as much notice as possible when ordering a cake, as we bake all of our cakes fresh to order less than 48 hours prior to delivery. Add an image to your comment (Allowed file types: jpg, gif, png, maximum file size: 2MB.